Steve Cavella, who played at University of California-Irvine and now coaches the highly ranked Menlo High School girls team, often has his players divide into groups of four early in practice and play 2-on-2 on half the court. He calls the game “Doubles Ladder” and says it’s not only a good warm-up but also gets players lots of touches and is competitive and fun. 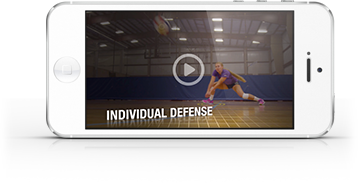 Each mini 2-on-2 game is played for a set amount of time … just a few minutes. The games are scored. When time is up, the winning team moves in one direction, the losing team moves in another direction. Then, new games begin. If coaches are “scoring” practices to see which players are producing the most points, scores of these mini 2-on-2 matches can be part of the total tally. Here’s a look at “Doubles Ladder” and some thoughts from Cavella and one of his players about why it’s a good practice drill.